Oh I did make my own…….I’m just being greedy!!!!! lol!!!!! Love your quilt. What a difference a beautiful border makes. 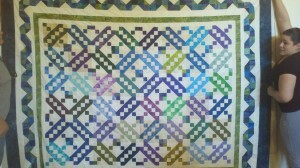 This is one of my favorite blocks and I’ve made a quilt of my own with this block. Your border is perfect.